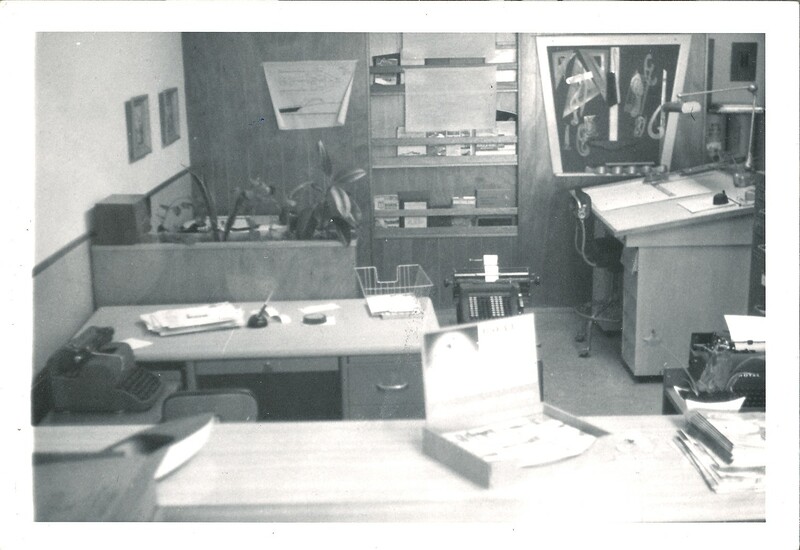 My father, Glen L. Witt, started Glen-L Marine in the back bedroom of his home in Compton, California in 1953. 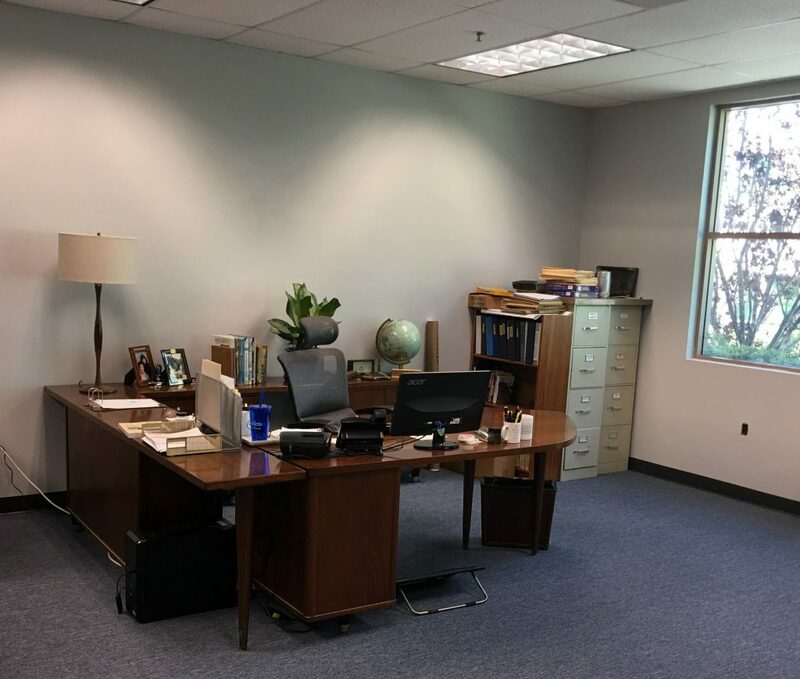 He soon found a small office he could rent down the street within walking distance. 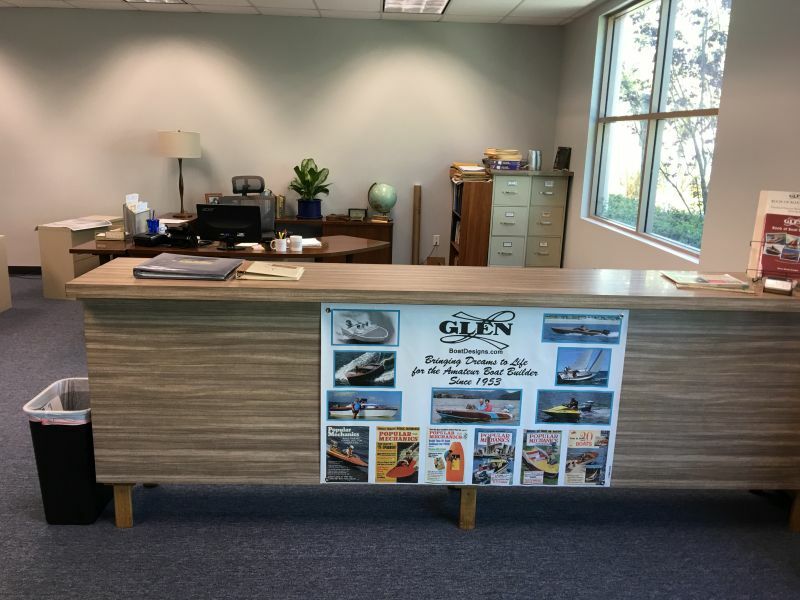 Fast forward to 1956 and Glen-L Marine was in a position to not only purchase a property but also build a facility for our growing business. I’m not exactly sure when the building began, but the office opening party was in 1956. Through the years, my father was able to purchase two adjacent properties. There was a man in town who my dad said was property rich but couldn’t put food on the table, so he approached my dad to buy one of his properties and later on, the second property. They built the shop that housed the frame kit building part of the business on one of these new properties directly behind the front office. This property was a long sort-of “L” shape, so there was still a vacant lot next to the office that remained vacant until about 5 years ago. Later, a warehouse was added off of the shop and located on the third property. This was a unique building with 2-1/2 block walls and the other 1-1/2 walls were sliding panels. It was a less expensive way of building the warehouse and also meant it was always dirty because the wind would blow debris under the “walls”. It worked well for us, though. The total square footage of the buildings was a bit over 9,800. 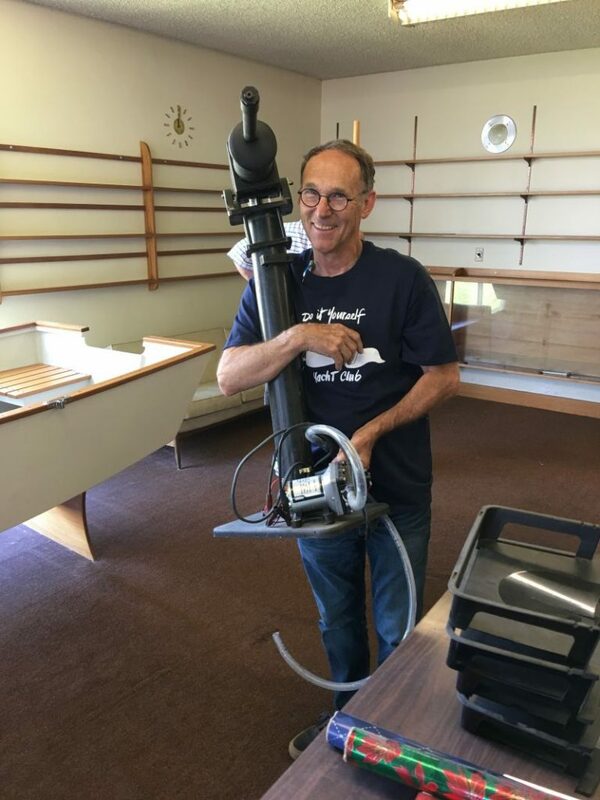 After our Shop Foreman and frame kit builder, Allyn retired and moved out of state in 2006, we discontinued our frame kit line and began leasing out our shop area to American Rentals who had been next door to us. Eventually, they expanded to also occupy the vacant lot portion of the property that was adjacent to us. After my dad passed away in June of 2017, I became trustee of his trust and through the year, we put all of his properties on the market. The Glen-L property was the last to go as it took about 9 months from listing to close because of some lot adjustments the buyer was working out with the city. 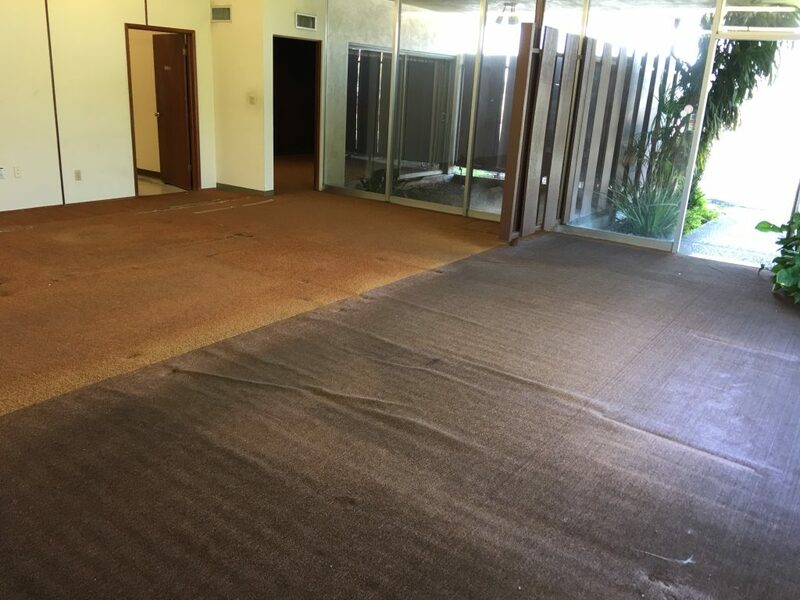 My husband John and I moved from Whittier to San Clemente about 6 years ago and knew that at some point, we would move the business closer to home. And, that’s what we did! We found a commercial condo in a business park about 10 minutes from our home. What a blessing it is to not have to drive the freeway an hour each way to get to Bellflower. 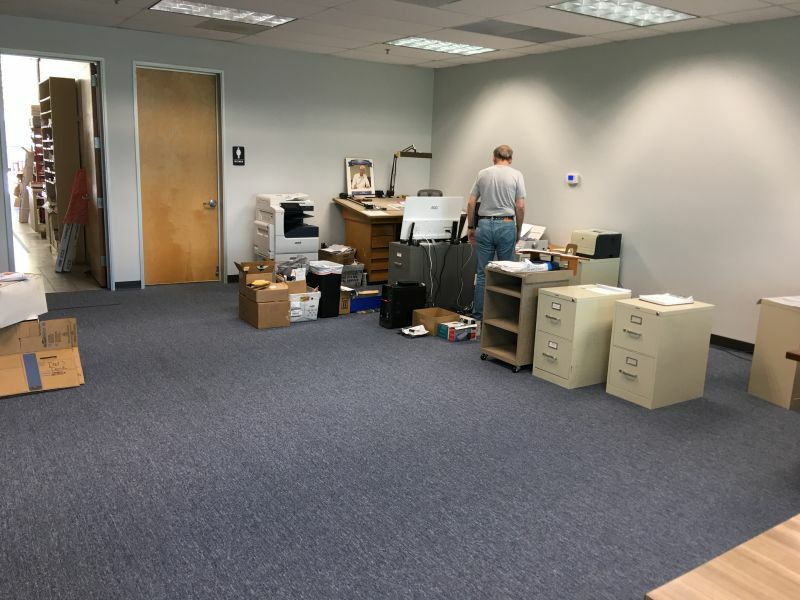 The new place is just over 4,000 square feet and it has a separate upstairs unit that we will eventually lease out. The move was a challenging one, that’s for sure. For months, I went through everything and pared down the things we no longer needed, all the while, making sure to keep the things that were important. My Dad left me a note that says “Please use common sense and judgement. Don’t keep anything for sentimental reasons. The pond or business are properties; don’t keep them because you think I might want it to remain as is.” Admittedly, I did keep some things for sentimental reasons because that’s who I am. The business, however, isn’t “sentimental”, it’s my business that I enjoy and John and I are thankful to be able to continue it. Once we moved the things we needed, we had our one day moving sale which I announced via email. We were able to get rid of a lot of good stuff, including some boats and then had the rest hauled away to be recycled. Old Office in process of moving–very old desks! I noticed that the desk in the old photo from the 50’s at the top of this post was one of the four we had until we moved! They were steel and super heavy and all but one had a “typewriter return” that popped up. I’m now using my dad’s mahogany desk that I’ve always loved and we’re looking for a new desk for John. 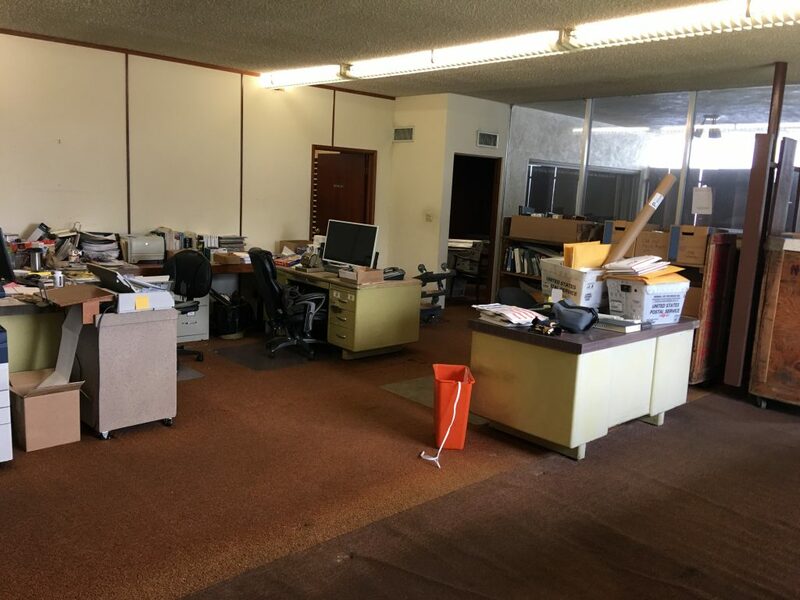 Yesterday was a real privilege, a pleasure and a bittersweet experience: the end of the Rosecrans Days after 62 years. 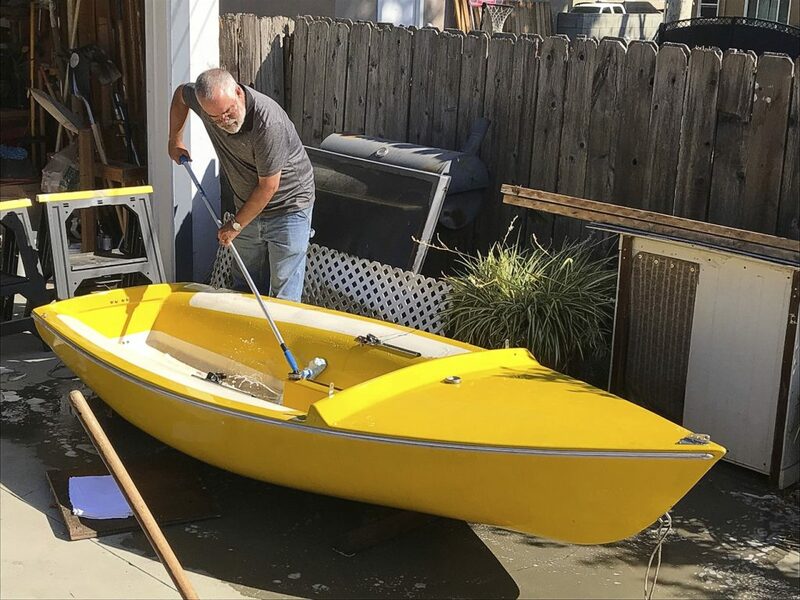 Once we had “Feather” (now: “Fin’ly Friday”) in Dave’s drive, the planks of mahogany stored in his garage, that I was wearing my retro Glen-L t-shirt, that the water cannon and the proof-of-design model of Bull’s Eye at my home, it occurred to me that we had lived some of the last moments of what Glen had built (in Bellflower). 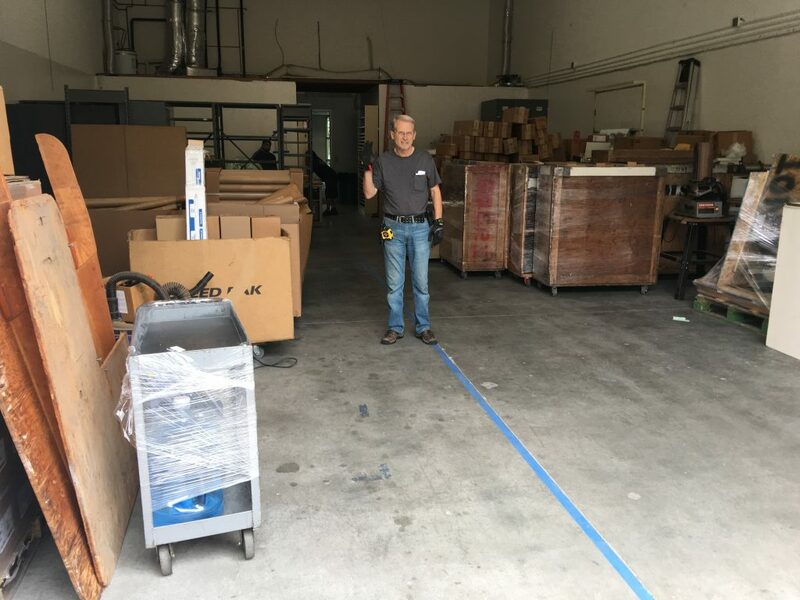 It was something special to stand in Glen’s office, and to get filthy dirty gunk-holing through shelves, boxes and bags in the warehouse yesterday. It was kind of sacred for me, having bought my Glen-L 10 plans back in 1972 and built “We’re Here”, then Minuet “Ark”, and Bo-Jest “Woody” over the years. My son Adam bought the plans and built “Dinky” when he was 12 (some help from Dad). He was glad to be there yesterday as well. I found the port cabin side pattern of “Lazy Daze” hanging on the wall. I thought that was especially significant since that was one of the earliest boats in the catalogue. I was a little sad to think of the significance of that. one gray piece of ply. I look forward to seeing the new digs in San Clemente. Doug’s friend Dave took home the Feather–it sure cleaned up well! These are the cabin patterns for the Lazy Daze which would be transferred onto paper. 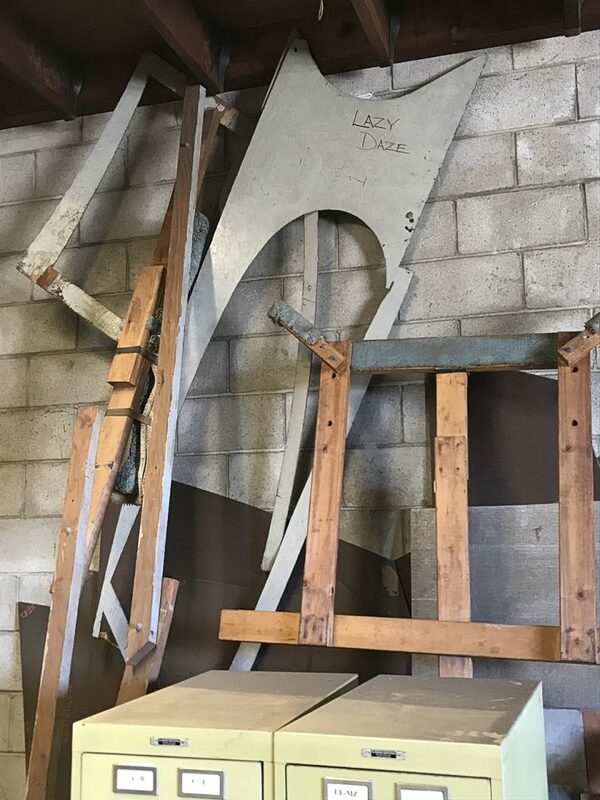 My “new” desk–thank you, Dad. Our front counter at the new office. My Dad’s original drafting table in the corner, and John’s makeshift desk. 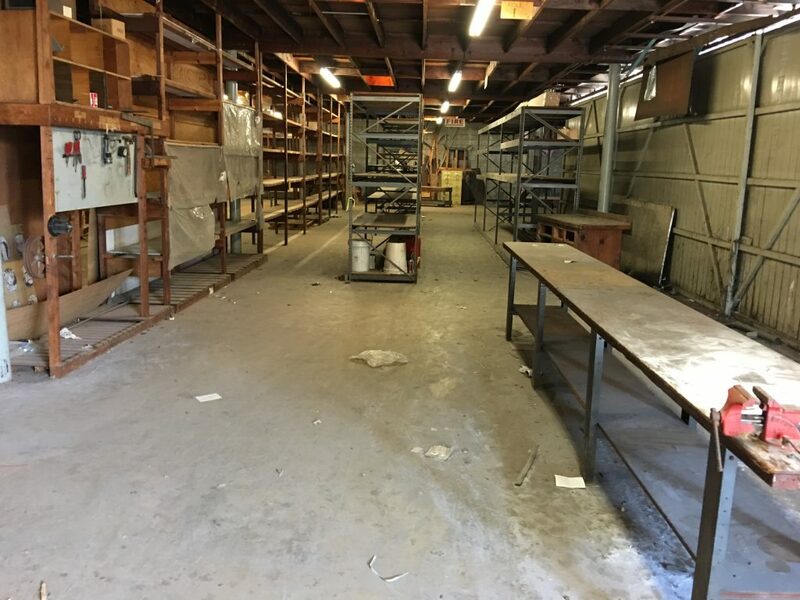 The Warehouse is through the door… more to come! 3 Responses to Glen-L Relocation is Complete! I had a small lawn cutting service and it helped pay for my first plan set. I new a lot of guys who built from Glen`s plans . We fished from the boats , we raced the boats, we water skied , we camped out of them and dreamed of the next boat ! Thank you for the history of Glen L Marine. PS I have spent 60 plus years in the maritime boat business and enjoyed it all. It was a bittersweet moment being there that day. The painting’s on the wall and the fish is perfect hanging above the fireplace. Hope you enjoy your new digs. I will miss the old place. I know you won’t miss the commute. I’m glad you were able to stop by and get a few mementos–it was nice to see you!